Speech is not easy in the face of tragedy. Words can’t capture the depths of grief, but they can circle slowly at its edges and, in their circling, evoke the empty center. In “February 26, 2012/In Memory of Trayvon Martin,” published in Citizen: An American Lyric (2014), Claudia Rankine uses short, declarative sentences to evoke and validate Black Americans’ grief in the face of racist violence. In her poem, Rankine uses declarative sentences to develop an informative or factual tone. The poem begins with a paragraph composed almost entirely of declarative sentences, and this form of syntax repeats throughout the poem. In the first paragraph she writes, “My brothers are notorious. They have not been to prison. They have been imprisoned. The prison is not a place you enter. It is no place. My brothers are notorious” (Rankine 89). Here, Rankine asserts that the criminal justice system and white America at large criminalize Black men and limit their opportunities. She explains that her “brothers” have not physically been to jail, but are still “imprisoned” by their notoriety and their inability to perform simple (non)activities like “waiting” unmolested. Rankine’s syntax breaks the various parts of these assertions into deceptively straightforward statements. Declarative introduce a subject, describe its action, and end with a period, creating the appearance of simplicity and factuality by drawing an apparently uncomplicated connection between a subject and an action. Rankine expresses sentiments of great political and figurative complexity as matters of what simply “is” or “is not.” This gives her statements the feel of common (and unremarkable) knowledge. Rendering her ideas as common sense both evokes the numbing effects of continual tragedy and challenges the racist strategy of denying the validity of Black people’s experiences and knowledge. The accumulation of declarative sentences on the topics of imprisonment, racism, and the inability to exist creates a contrast between tone and subject. The factual tone combined with the sorrowful subject matter mirrors the detached manner of a person who is experiencing shock, or who has become numb to grief through the proliferation of tragedy. When dehumanization is part of the fabric of a person’s everyday life, pain must, at times, go underground for the sake of survival. Rankine’s detached tone adds to the power of her poem by underscoring the constant nature of racist violence. Furthermore, her tone is an implicit valorization of the knowledge Black people gather through their daily experiences— knowledge that white people devalue in order to maintain our power. By stating these appearances in a factual tone, Rankine asserts their truth. Rankine, Claudia. “February 26, 2012 / In Memory of Trayvon Martin.” Citizen: An American Lyric, Graywolf Press, 2014. Why don’t we talk openly about race? I think this image presents just a few reasons why. But within the history of the united states, race is subject that is barely explored in depth, whether it be in the media or between friends in conversation. It is hard to talk about race, and it is also difficult to understand the real reason why. Claudia Rankine’s collection of poems in her book, Citizen: An American Lyric (2014), explains and presents exactly why peopler so afraid of these conversations, and she does this without any of the frilly poetic elements you would expect from an collection of poems. Rankine is to the point, and states bluntly why, without needing to soften the blow – because it is time that we recognize this deafening silence and tune into the static, white noise that has been the soundtrack of the American life for centuries. Within the opening of Citizen: An American Lyric (2014), Rankine includes a poem that exemplifies the difficulty of having conversations about race. She frames this issue by addressing the reader directly and inserting them into a conversation between a black and a white friend, allowing. The reader to choose who they align with. Through this, Rankine formulates her poem into a personal experience for the readers and furthermore forces them to think about their own interactions, and their own shortcomings or obstacles within racial discourse. Rankine introduces the concept of one’s “self” and ones “historical self”. “Self” meaning the way in which one views and presents themselves aside from their race, and “historical self” meaning the way in which one is labeled categorized or perceived due to the historical context of the color of their skin within American history. Rankine’s use of diction in relation to the convergence of a black and a white persons’ “historical [selves]” is both broad and specific, but through this duality, Rankine creates a moving statement within the text that pinpoints the difficulty of racial discourse. The use of broad diction in reference to the phrase “American Positioning” forces readers to pause and think about the impact of the writers choice. What is my position? Where does my historical self put me? The word position has several different meanings. When we think of position we often think of a literal place in which exist, where we literally stand. Or, we think of position in terms of advantage or disadvantage, where we stand compared to others. Rankine’s choice of diction brings to light all of these implications and definitions and forces readers to confront that their “American positioning” will never be defined by their “self” but by their “historical self”, because race in America will always be at the root of all interactions, friendships, schools, institutions, and governments. It forces readers of all ethnic backgrounds to acknowledge that they are physically positioned in a nation that is designed to oppress, and that they are either in a position of advantage or disadvantage. 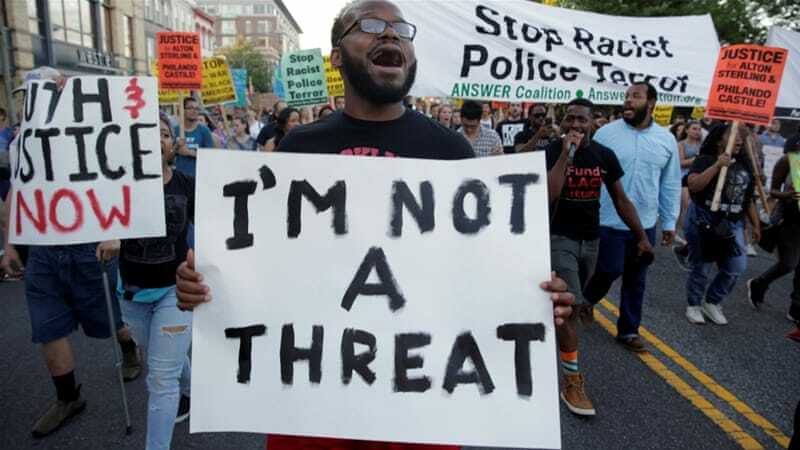 Rankine’s choice of diction is a small yet central component to the piece as the vague nature of the word forces them to confront themselves, but simultaneously the bluntness of the statement and connotations that are aroused demonstrate exactly why there is a fear associated with racial discourse. People are afraid – especially white people – are afraid of realizing the position that was built for them. And minorities, specifically African Americans in the case of the poem understand this position yet have to live in a nation that will not acknowledge this injustice aloud.